Photo (2.5 x 4 inches) inserted into a greeting card designed to hold a photo (measures a bit more than 4 x 5.25 inches closed). Printed on the front of the card is Thank you for your lovely gift. Handwritten inside is Thank you, Irene + Bill. They say a picture is worth a thousand words. Though I’ve looked at this card plenty of times before, it wasn’t until I was creating this post that I realized how little Irene and Bill have actually said here. There’s a pre-printed message on the front, and inside they just wrote “Thank you.” There’s nothing personal, no mention of what the gift was and how useful or meaningful it might be, etc., what I think of as standard thank you note stuff, even when they don’t know the giver well, or when there are hundreds of gifts requiring thanks. But there’s a photo, and the photo says a lot. In fact, the photo is the only thing that indicates the gift was for a wedding. So even though the gift giver may notice a dashed-off quality to the card, I didn’t. The photo tricked me into thinking more was said than actually was. Her upturned foot immediately caught my interest. Were her feet hurting after a long day in never-worn shoes? Could be. I was assuming she had happy feet from being so excited, but your explanation makes perfect sense, too. I did the same thing when we got married: had cards printed with a wedding picture. It almost made no difference what I wrote inside. Exactly, it’s obviously an approach that works, since the photo can say so much. Could there have been an additional note included? (now lost.) Or was this in an envelope with nothing else? 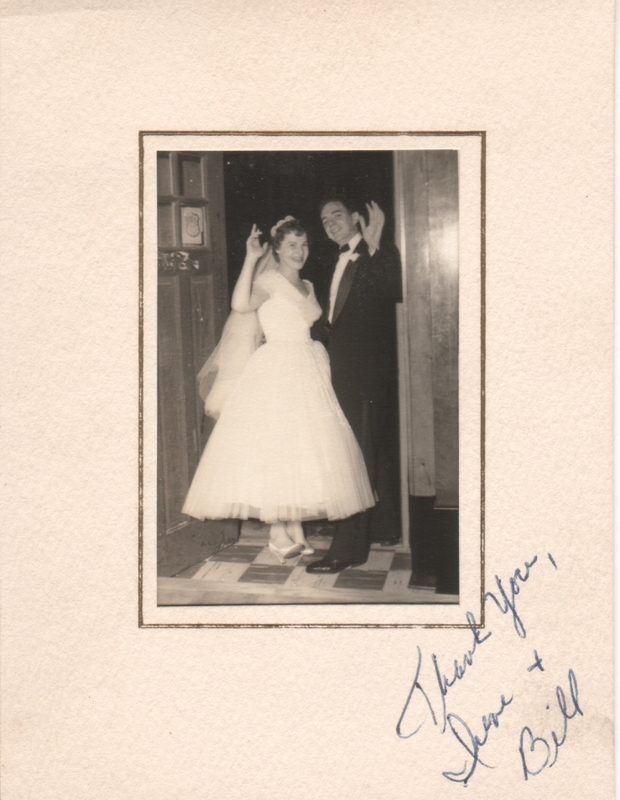 I have to say, Irene and Bill are pretty bad at writing thank-you notes–especially for the 50’s–although I would certainly rather get this cute photo than nothing! Yes, there may have been more included, but at this point I have no idea what, if anything, it might have been. All I have is this card with the photo inserted, no envelope or other documents.